The three months between the October and February residency seemed to go very quickly, perhaps because it was such a busy time, both in and out of school. Yet, when I had only one week to go until the February residency, I realised just quite how much I had missed being with NYDC. The intense dancing, long days and amazing friends meant that I was super excited to get back into the swing of it as quickly as possible! Now, having had yet another fantastic experience with NYDC, being at school again feels like torture and I cannot wait to have the final residency in April. So, on Saturday 11th February, I set off to spend my half-term holidays doing something I love! The company was reunited at the train station and had a few moments to do some excited catching up, before being whisked straight into the studio to begin rehearsals. The first session was particularly hard, as we had to get the movement and the quality back into our bodies, but after that the week’s classes went incredibly quickly. Each day we rehearsed previous material, learnt many new phrases and then later in the week, we started adding choreography together. It was amazing to see how a few bits and bobs of movement could suddenly expand and become 7 minutes of the piece, in fact it was thrilling! During the week, we got to know Damien’s way of working more and more, and, thanks to the toolbox sessions, we were also given an insight into his other works and choreographic career. This was particularly inspiring, as it reinforced for me how lucky we are to be working with such a renowned artist, who has made daring, exhilarating pieces before and is now working with us. We were also very lucky to have James and Aimilios on this residency, two of the most wonderful dancers, who were so inspiring to watch and also extremely supportive. By the end of the week, I felt that as a company we had achieved loads, and individually, I was also really happy with my week’s work. 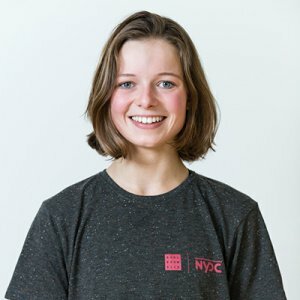 NYDC is a commitment outside out of the residencies as well, and it is very important that we practice, because our time in the studio is actually quite limited in comparison to the length of work we expect to make. With this in mind, I had duly practiced and prepared, ready for February. This helped me to improve, and also, allowed me to pick up phrases on the second residency quicker than I had done on the first. For me, NYDC is all about challenging myself and getting out of my comfort zone, and on this residency, I pushed myself. I am proud of what I have achieved in NYDC so far, and this is definitely a continuing aim and I’m hoping that the next residency will help my confidence in dance even more! Perhaps my favourite part of the February residency was seeing NYDC shift from a group of dancers to a company, and creating strong bonds with almost every-other dancer. At first, a company of 40 sounded very large, but it is amazing how quickly we connected in dance and as friends. On top of our classes, some members of the company decided to go into the studio after lunch and dinner and improvise. It was beautiful and very moving to watch, and even more exhilarating to join in with. I think it was this, and the quick developments of the piece which consolidated the company and proved our love of dance! The February NYDC residency was absolutely brilliant, with never a dull minute. I am so excited for our next residency, the premiere and the tour and I’m sure that there are many amazing things to come!